An overview of the Penn State football team as it gets ready to start preseason camp Monday. 1: Starter returning on the offensive line (LT Donovan Smith). This is, without a doubt, the biggest concern entering the season and the reason why the Lions could struggle to post a winning record even with a favorable schedule. 2: Weeks into camp that the coaching staff will have a good idea who will be starting at most spots. 3: Let’s call this the myth about RB Zach Zwinak. It’s how many fumbles he had last season, all coming in the first seven games, which was a problem. But he carried 115 times without a fumble in his final five games (23 per contest). Bill Belton, meanwhile, also had three fumbles last year – in his final four games – but people don’t seem to hold that against him the way they do Zwinak. 9: Wins at Vanderbilt each of the past two seasons for new head coach James Franklin. Any coach who can win nine games at a doormat like Vandy should be considered very promising, and Franklin certainly is that. 14: Number of quarterback Christian Hackenberg, by far the most important player on the team and the reason why eight or nine wins is possible despite the suspect O-line. It will be fun to watch how much he’s progressed from his strong freshman season. 26.2: Points allowed per game last year by PSU, a number that must drop significantly. 27: Days until the opener in Ireland against Central Florida. 72: Scholarship players on the team to start the season. 80: Scholarships for next season. 85: Scholarships for 2016, the full allotment allowed by the NCAA. Remember, had the scholarship sanctions not been reduced last year, PSU would be playing with 65 scholarships from 2014-17 and wouldn’t be back up to 85 until at least 2019. 97: Catches by Allen Robinson last season, a school record and a huge void that will not be easily filled by any two or three players. 1. Franklin factor: We have no idea exactly what the new coach is going to do in so many respects, which makes for a lot of intrigue entering a season. When Bill O’Brien was hired, it was easy to predict the style he was bringing because of his background with the New England Patriots. But has anybody really sat down and watched a ton of Vanderbilt game film to see what Franklin did there? The answer to that is: Why bother? Franklin didn’t have a quarterback like Hackenberg at Vandy. He didn’t have the caliber of all-around athletes that he’s getting and will continue to bring to Penn State. And he was playing in the SEC, where the game is just different in a lot of ways. Franklin is said to be more of a CEO who delegates to his assistants than an overly hands-on head coach. He’s the energetic, passionate motivator on the sideline. But what will the offense actually look like? And the defense? And his strategy in various situations? And, you know, can he actually coach? We’ll find out in just a few weeks. 2. Hack attack: He’s a star in the making, no doubt, so what can we expect to see from Hackenberg? He’s not only a year older and wiser, he’s also bigger and faster. He won’t have his favorite target with Robinson gone to the NFL, but he will have a bunch of talented tight ends and young, speedy receivers. Look for Hackenberg to get rid of the ball in a hurry, meaning short drops, quick outs, screens to running backs and heavy use of the tight ends. Also count on him throwing on the run a lot, something he did very well last season and should only be better at this year. As good as he already is, we’ll probably only get to see Hackenberg in a PSU uniform this year and next, then it will be off to the NFL. So enjoy his immense talents while you can, and hope he stays healthy behind that offensive line. 3. 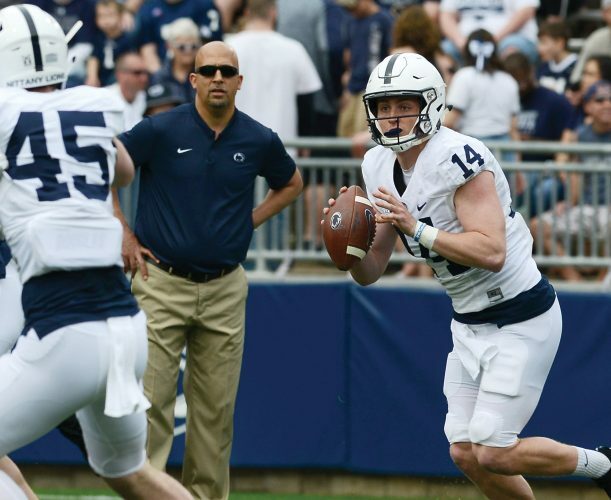 Terrific tight ends: Jesse James, Kyle Carter and Adam Breneman make up the best tight end trio in the country, plus there’s the return of Brent Wilkerson from a back injury and the addition of impressive freshman Mike Gesicki. It’s what you call a plethora of riches. Who will have the best season? James is getting all the preseason hype because of his freakish athletic ability and NFL potential. But don’t forget about Carter, who had 36 catches two years ago but was never fully healthy last season. 4. Eastern rivals: OK, the word rival is up for debate since Penn State has dominated Maryland (35-1-1) and Rutgers (22-2) over the years. Still, the Big Ten’s newest additions do give the Lions some Eastern competition, plus shorter trips for fans. Rutgers isn’t expected to be strong this year, but look out for that night game there in week three. Lots at stake there from a recruiting standpoint for both teams. 5. Let’s go bowling: We’ll find out probably in September if the NCAA will give Penn State back its bowl game for this year and next. The guess here is it’s 50-50 at best for this season, and more like 80-20 next year. 1. O-line concerns: It will be OK if the line is just mediocre or even a little below average. The Lions can still have a winning season if that’s the case. But if the line is really bad, which is a possibility, then all bets are off and there will be no way to estimate how the team will fare. Protecting Hackenberg is the No. 1 priority, and everything Franklin does in that regard has to take into account the likelihood that the line – at least early on – will not be able to keep the quarterback upright very long. 2. Not the Linebacker U we’re used to: It’s a rarity, but linebacker is a big concern. Mike Hull is a quality player when healthy, but no other member of the unit has proven himself to be a consistently reliable linebacker. 3. Inexperience and depth: There are some talented youngsters on the roster, but many of them have never been counted on to contribute the way they will be asked to this season. The biggest example is receiver Geno Lewis, who looks to be a good player in his own right but has the pressure of trying to fill Robinson’s gigantic shoes. From a depth standpoint, having only 72 players on scholarship figures to be a big issue as the season grinds on. 4. Ireland trip: It was set up as a reward by the previous coaching staff, but it’s basically a big hassle for the new staff. Concerns include logistics problems with travel, jet lag issues, keeping everyone out of trouble in a foreign country and getting back to the normal schedule after the trip. That’s not even taking into account the health of the team. With such an unusual trip, and playing a decent opponent, the last thing the Lions can afford is to get anyone injured in Ireland. 5. Bottoming out: This could be the worst season from the sanctions fallout. The Lions were able to go 8-4 and 7-5 the past two years primarily because there were still good players left over from before the sanctions and they were coached well. Franklin appears to be a good coach, but this team is not as talented or as deep as the past two years because of the scholarship reductions. Then again, it does have an excellent quarterback, which will help solve some of the issues. Still, even with a favorable schedule, it’s hard to see this team having as good of a year as the 2013 squad did. Remember, the Lions needed a huge upset in the finale at Wisconsin to avoid a 6-6 record. It will be tough to match that 7-5 mark this fall.